Here's a photo of the radioactive sock (of doom - thanks J!) 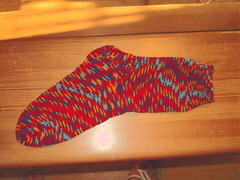 The colors still aren't quite right - the camera can't capture the true brightness of this sock. I have a close up, as well, that's a little better color-wise, but flickr doesn't seem to want me to post 2 photos at once. :sigh: I'll post it in a minute.